Commitment to continual learning drives Russell Hunter, GC’14, to consider the potential effects of drone use on different cultures and to predict unintended cultural shifts as the result of extending drone usage. Working with Common Ground and interning at the White House help shape alum’s career path. Less than a year after she aided in the establishment of University of Richmond’s Delta Sigma Pi (DSP) chapter, Colleen Tobin, '14, wins the DSP Regional Collegian of the Year for the Mid-Atlantic. In his journey to live with intention Austin Butler, '14, seizes an opportunity work with Andy Stefanovich, curator of TEDxRVA. Determined to engage his students as a meaningful part of the Richmond community Dr. Ray Slaughter brings his taxation classes to UR Downtown to volunteer with the IRS Volunteer Income Tax Assistance Program offering free tax preparation for lower income individuals. 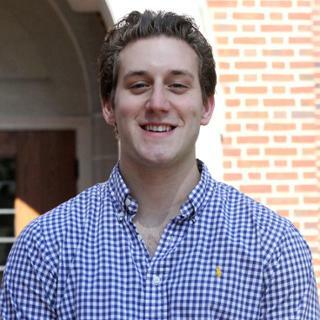 In March Ed Riley, '14, traveled to Dallas, Texas to present his thesis topic to an audience of peers and faculty from throughout the East Coast and Texas as well as members of the Federal Reserve Bank of Dallas at the 2014 Economics Scholars Program. After earning her bachelor’s degree in paralegal studies from the University of Richmond, Megan Barger, C’14, will follow her passion for law as a student at Appalachian School of Law in Grundy, Va.
From an administrator to Career Services to the Office of International Education and the Modern Languages and Cultures Department, an opportunity to translate an international business meeting lands with Bennett Jacobs, ’14.